I must get my attention to detail from my maternal grandfather William Liming Redles. I've been told it's my greatest strength and my greatest weakness. My grandfather seemed to pay attention to every little thing! Even women's fashion. In some of the letters he wrote to my grandmother Leona Roberts after they were married, he suggests what clothes she should wear for traveling and visiting, right down to the color and fabric. He even named several items of clothing that he knew she had. After they were married and while he was on Marine duty in Washington, D.C., he would occasionally send fabric, gloves, dresses, stockings, shoes, and hats to her in Valdosta, Georgia, when she on was on extended visits with her family. In a letter dated May 27, 1922, that my grandfather wrote to my grandmother before they were married, I found this newspaper clipping of a fashionably dressed woman. They had just started corresponding with each other only a few months before. Was he keeping her up to date on the latest fashion in the big cities up north? I wonder what my grandmother thought about that dress! 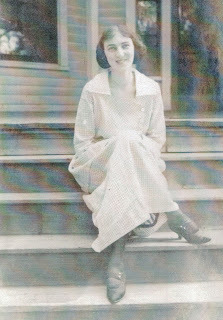 The shoes in the clipping made me think of a photograph of her sitting on the porch of her parents' house, probably taken in the 1920s. My grandfather mentions in a letter to her that his friend Warren Graham (who was married to my grandmother's sister Margaret) had given him a photograph of my grandmother sitting on the front porch. My mom and I wondered if it was this photograph. In a January 11, 1922, letter to my grandmother, her brother-in-law Warren Graham quotes at length from a letter that my grandfather wrote to him after seeing her photograph, "...that dress is neat and graceful...I think she is the prettiest girl in all the South...Please tell Miss Roberts to bring both pretty feet to Washington." The newspaper clipping, photograph of Leona Roberts, and letter from Warren Graham are from the personal collection of Leona Redles Pendleton, Valdosta, Georgia. Beautiful, but . . . OUCH!